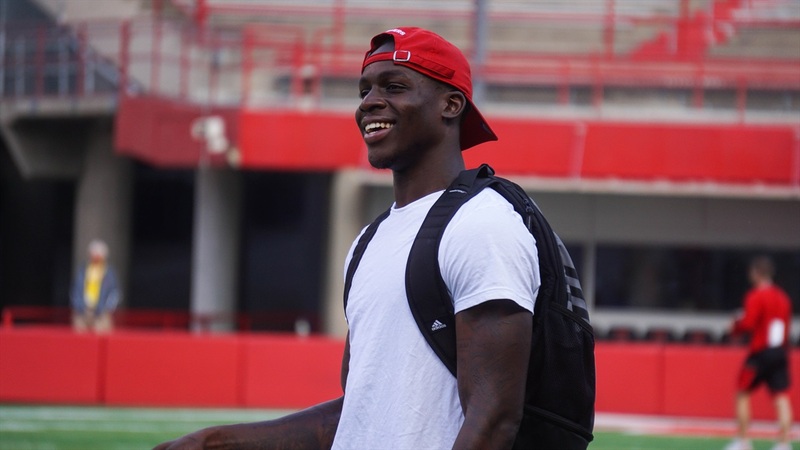 Caleb Tannor was one of the biggest gets for the new Nebraska coaching staff in the 2018 recruiting class. A 4-star linebacker from a small town in Georgia — Lithonia, with a population around 2,000 — Tannor committed to the Huskers on signing day. When he arrived for fall camp, the coaching staff had a plan in place for him to hit the ground running. Early returns were positive. Tannor's only real chance to impact Saturday's game came on special teams. He didn't see time on defense with Nebraska in a back-and-forth affair with Colorado, but the expectation is that Tannor will play at some point this season. It's likely a redshirt year wouldn't be burned just for special teams work. Tannor met with the media on Monday to cover his first game at Nebraska, who has helped him since arriving in Lincoln and playing like Blackshirts. The following is the Q&A from that meeting, edited for clarity. Media: What was that experience like playing your first game inside Memorial Stadium? CT: It was a great feeling. Stepping up from high school to college, it’s just a different atmosphere. It’s just a good feeling. M: Was the stadium bigger than you maybe imagined it was going to be? CT: Most definitely. Me coming from a small town, you don’t see that many people [for a football game] every Saturday. So going out there and playing for them just makes me feel good. M: What was the reaction from folks back home? CT: A lot of people watching. They just felt good because nothing big really comes out of where I’m from so it’s like, me going big to someplace like Nebraska? It feels great for them. M: How many messages did you have on your phone after the game? CT: Too many. Too many. Even in a loss, too many messages. Keep your head up, do this, do that. It’s all good stuff. It keeps me motivated. M: How many plays do you think you got in for on Saturday? CT: I can’t even tell you, that’s off my mind right now. We’re on to Troy. M: What have coaches told you about your role? CT: They haven’t told me my role. They’re not trying to boost my head up or anything because you know how freshmen get so I’m just going to keep doing what I’m doing. I’m honestly doing the right things so I’m just going to keep doing what I’m doing, keep working, keep making my brothers better, keep making my teammates better and that’s how it’s going to go. M: Coach Dewitt said you were one of the quicker learners he has, what was key for you to picking things up so fast? CT: Just listening and watching. Sometimes you’ve just got to sit back and watch and then when it’s time to execute, go and do it yourself. That’s what I did during the summer. [Linebacker] Luke [Gifford] was a big influence on me. Ace, [linebacker] Alex Davis, those guys, I appreciate them very much for getting me in this position. M: What’s it like watching Luke Gifford work out on the field? CT: It’s great working with Luke. When Luke is on the field, he’s like another Coach Dewitt because he knows everything, so you’re just watching him [and thinking], ‘Alright, Luke did that, Luke did that, let me go out here and do the same thing he’s doing.’ Luke’s a great role model. M: What about your relationship with Mohamed Barry, both being Georgia guys? CT: That’s my brother. We both come from Atlanta. His mom knows my mom now. They just met at the Akron game and the Colorado game they were sitting by each other. Mo’s my boy. Ever since I’ve been down here, he’s been by my side, been my dog. That’s just like a brother to me. M: Nice to see him have the game he had Saturday? CT: Yes sir. He had a great game. He flew around. Loved to see Mo like that. That’s the Mo we need. M: Did his play surprise you guys on the team? No. No, because, like I said, he does that in practice so it surprises y’all because you’re not there in practice but when we’re there in practice we see him so when he’s out there on the field, it’s just another practice. M: Did you know about the history of guys wearing the No. 4 when you picked it? M: Was there a reason why you picked it? M: Why the switch from No. 1 to No. 4? CT: Just some technical difficulties we had on special teams, two No. 1’s on special teams so we just switched it out. Nothing major. M: How does the team bounce back from Saturday’s loss? CT: We’re just going to keep doing what we’ve been doing. We’re going to minimize some mistakes but we’re going to get after it. M: You guys had seven sacks Saturday, was it cool to see the team have so much success? CT: It was amazing, just seeing the Blackshirts get after the ball. That’s all we do in practice. You practice how you play and that’s what we do in practice. I wasn’t surprised. M: Do you guys feel like you’ve adopted the mentality of the Blackshirts? CT: Yes sir. Most definitely. We get after it every day in practice. We have no choice but to do it in the game. That’s how it is.